“Pine Forest” was stamped twice leaving a little space between to give the illusion of a path. 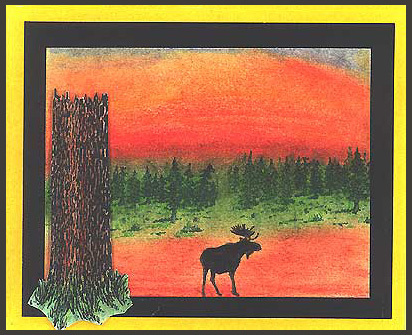 “Moose Silhouette” was stamped in Memories black in the lower part of the card. “Tree Trunk” was stamped in black Memories, colored, cut out and placed on the card with foam dots. All coloring was done with chalks and sprayed with a fixative. Card by Margaret Wiggin.